JSU alum and trustee Randy Owen, center, has organized a benefit show featuring his country supergroup Alabama. The latest wave of artists added to the roster for the Alabama & Friends benefit concert on Sept. 26 have been announced. Jason Isbell and the 400 Unit, John Berry, Gordon Mote and SiriusXM's Storme Warren will join the star-studded lineup at JSU’s Burgess-Snow Field. 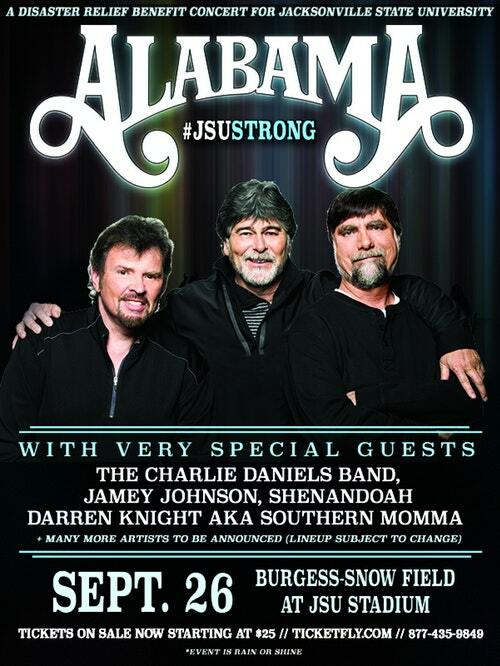 Country supergroup Alabama will headline the concert, organized by lead singer and JSU alumnus and trustee Randy Owen. The show will be the Country Music Hall of Fame inductees only appearance in Alabama this year. All proceeds will be donated to JSU for tornado recovery. "We are so thankful and blessed that friends of ours, and some from our great state of Alabama, have offered to help raise funds to repair the damage from the horrific tornado a few months back," said Alabama frontman Randy Owen. "The university has been wonderful to work with on helping us setup the concert. From the looks of ticket sales and strong support from sponsors, this will be a very special night for the attendees." Nationwide Insurance (Randy Jones & Associates, Inc.) has signed as the presenting sponsor. Platinum sponsors include Dr. Pepper (official drink of the show), Alabama Power, Alfa Insurance, Marc and Mary Angle, Ken and Jenny Howell, Alabama Ford Dealers and Trycon Tufters. With these generous sponsors onboard to cover the concert's expenses, 100 percent of the evening's proceeds will go to Jacksonville State. "I'm proud to have the opportunity to be the title sponsor for this great event and wonderful cause," said Randy Jones of Nationwide Insurance, a JSU alumnus and trustee. “I felt like this was a fantastic way to be able to give back to the school that has given so much to me and we can't wait for what will be a great night at Burgess-Snow Field." The rain or shine event begins at 6 p.m. on Sept. 26. Tickets prices range from $25 to $100 and are available at Ticketfly.com or by calling 877-435-9849. A limited number of general admission tickets are available for purchase in person at the JSU Athletics Ticket office in Kennamer Hall. Also, a limited number of Stadium Club seats are available to JSU Stadium Club season ticket holders for $125 and can only be obtained by calling the JSU Athletics Ticket Office during regular business hours at 256-782-8499 or 1-877-JSU-TIXX. The ticket office is open Monday through Friday, 8 a.m. to 4:30 p.m.